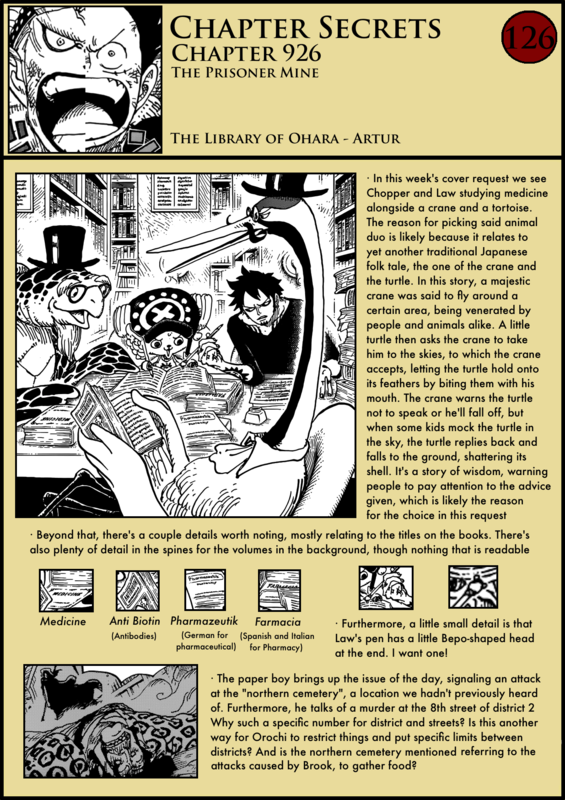 A tamer chapter this week, but it’s expected, given how utterly insane it was last time. With that said, as always, there’s still a lot to look at here, so let’s get started! Love your update Arthur! Keep it up. 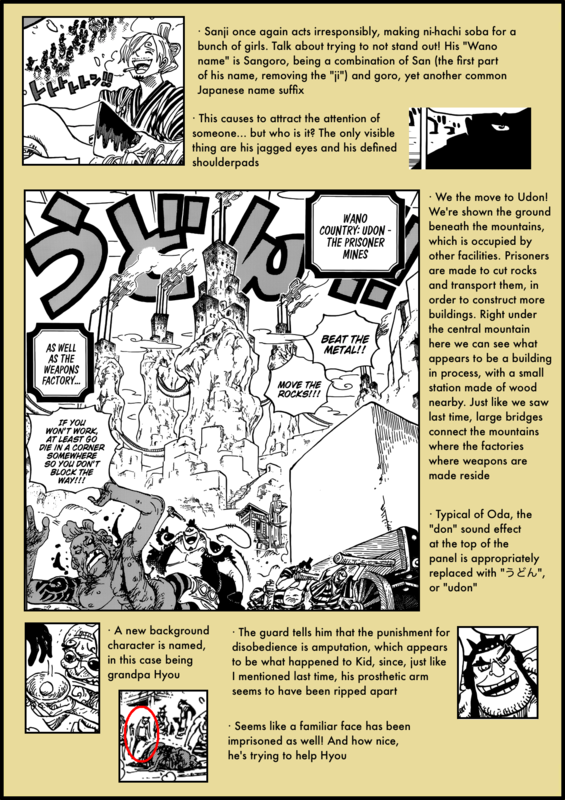 I am very impressed with Kid being able to keep up with luffy in carring those blocks even though he has one arm, impressive indeed. how can they move while chained with sea stone? does it mean other than they are just strong? We all thank you Artur, for your hard work. 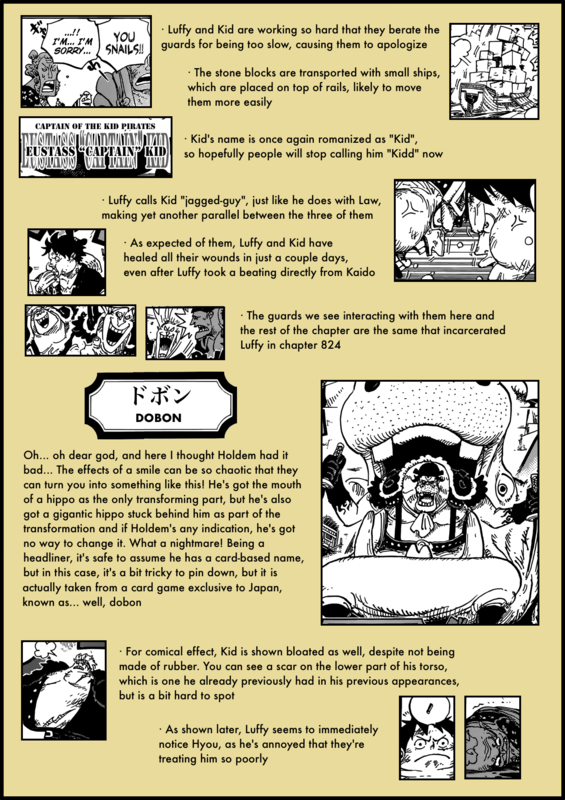 Even making luffy bloat out is in a comical sense(as you mentioned for Kid) here in this chapter as he is cuffed with seastone and can’t expand. 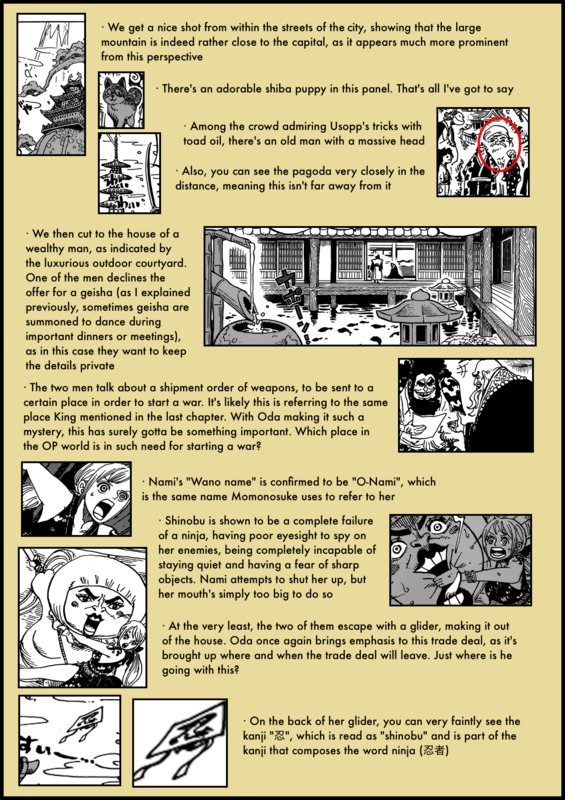 Fun chapter, I’m really starting to get excited about all the pieces coming together on Wano! Love the white haired Oden supporter that looks straight out of a 70s manga. Been missing Usopp and hoping he gets his moment soon! I’m excited for Nami to learn some kunoichi abilities but with a teacher like that?? Holdem and Dobon makes me wonder about the Smile failures–surely some end up being disasters. 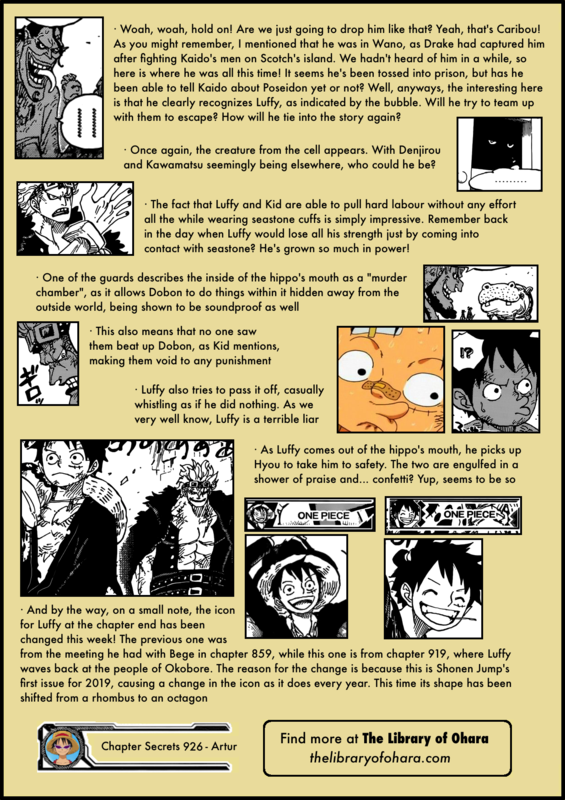 Kid and Luffy is already funny and cool as hell. This chapter is so interesting !!! And thank you for your analysis, it’s always helping me find some details I ignored. I never notied that the to be continued icon changes. I think the Goemon-esque thief might actually be Hiyori. She clearly had a bobcut in the flashback to Oden Castle being burnt to the ground, and the news reports on the culprit being a “boy”, wording which sounds rather odd if the individual is a man likely in his 50s. I always read your reviews Arthur and they’re awesome, congratulations and keep up the good work! Hi Arthur, thanks for your warm analysis. Another view of the cover story came to my mind when I read the your work. Turtle and crane in China alwayse means long live for old people. 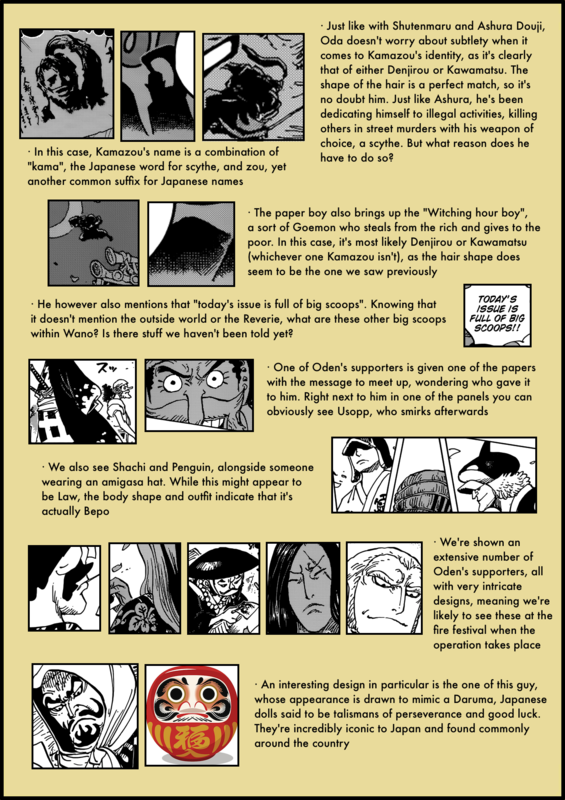 I wonder if it has something to do with kaido(just if). There is also a story in China about a turtle and two swans. The two are very same. Swans took the turtle to its new home with each other has one end of a stick in the mouth, and the turtle bite the middle. It’s the turtle who though of this idea. When they flew over a village, people down them saw it and said the swans are way smart to fly with a turtle. However, the turtle got angry and thought in mind that I am the one who thought of it. Time flew and flew, they came across another village. Unfortunately, the same scene happened, the turtle got furious and can’t hold it. The tirtle want to say something, but we saw the turtle falling down when opening its mouth.